As some of you may know, Jason Morse of The Crypto Crew has been researching and investigating bigfoot reports in New Hampshire, namely around Newmarket. 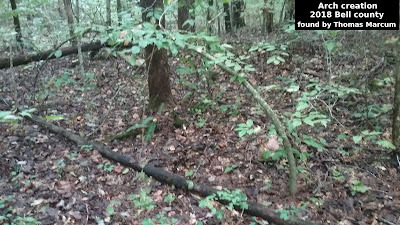 Jason recently took in a report of a possible sighting in that area, post can be read HERE, that we think may be the same bigfoot in some earlier reports. Here is some of Jason's earlier reports and investigation work - HERE & HERE & HERE. These post include photo and details about the investigation. We even have some possible bigfoot sound recorded and I will post the video at the end of this post. 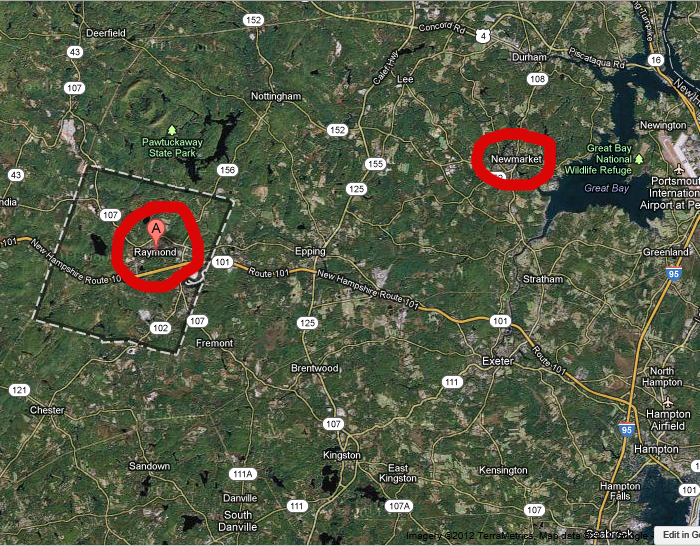 Now we have gotten a new sighting report coming from Raymond, NH. I'm told this is around 10-15 minutes from Newmarket, where there has been several sighting and some evidence. Here is the report I received via email and my exchange with the person. 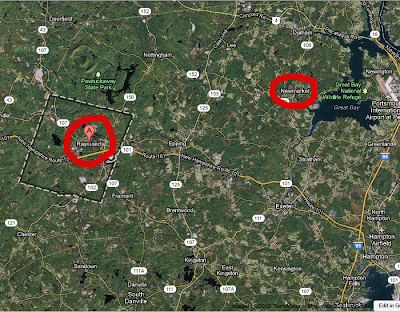 D said - " I would like to know if the sighting from nh in march of 2012 was in Raymond nh? My husband had a weird experience by a swamp last month that looks very familiar to the ones in the pictures. We have also heard some unusual noises input area. Not sure if we are just reading into things, but we usually don't believe in these things. Look forward to your reply." My reply - "These sighting were in and around Newmarket. I don't know how close that is to Raymond"
D replied - "It's about 10 miles away. My husband said he saw what looked like a bear on two legs cross the street where there is a swampy area on both sides early one morning. Two days later I heard what sounded like a bull in the woods. And the next night I left to run an errand and came home to an awful odor outside. Ten minutes later when I put my dog out it was gone." I am still trying to gather information about this sighting and will update any important info. The activity in New Hampshire has been good over the last year and we will continue to investigate. Very interesting. Living in Boston,with no chance of seeing a Bigfoot around here, knowing that a few recent reported sightings within an hour and a half or so away from me, makes me want to go up there tonight and look around. If I didn't have kids and if I wouldn't crap my pants if I saw one. Like this blog very much. Thanks Chris, more reports are coming in from the area. What video? the one above is just a audio one. Not saying its not a bigfoot. But I live in new England and screams like that come from either a Fisher Cat..more likely a red fox. It sounds like if I were to scream at the top of my lungs for a second and do it repeatedly. But you never know. Ive always bought that the bigfoot sounds were deeper and longer. I have had very similar to that while hiking solo while in Sandown NH. So, I typically get out of the woods about an hour before sunset both winter and especially early spring. While in and around my home both myself and others have heard several "screams" and "woops" while varying times of day and night. I am surrounded by swamps, small ponds, bogs, conservation land and a .25 mile from the ATV trails. I just stay out of the woods around here at night.